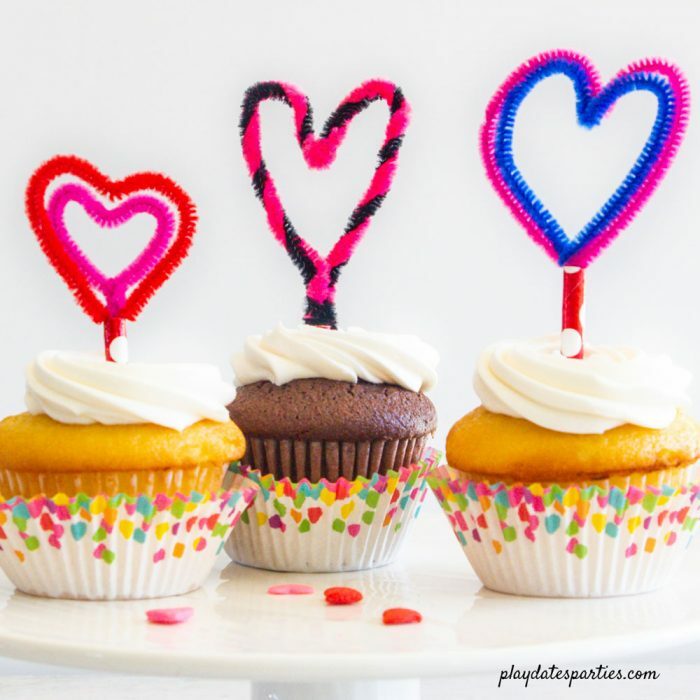 These heart shaped cupcake toppers are such an easy and fun craft to make with your kids. 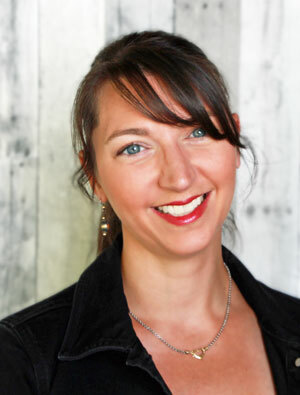 Find out our simple trick to make them food safe, too! You know that sensation when you have a piece of fuzz stuck in your mouth and you just can’t get it out? That image very nearly made me not try this craft at all. Even thinking about it right now sends shivers down my spine. Yuck. 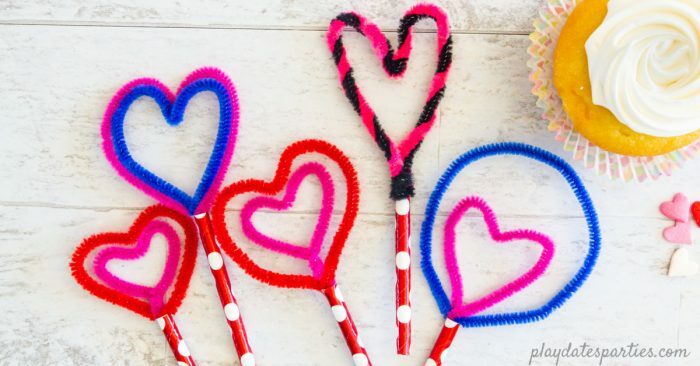 I’ve seen people make cupcake toppers with pipe cleaners before, and they’re always so cute…but I could just never get past the thought of pipe cleaner fuzz in my frosting. And then one day I was going through our craft stash, trying to keep the kids busy during a day off from school, when the solution finally hit me. Seriously, it was so ridiculously simple, I don’t know why it didn’t occur to me before. The solution to the fuzz problem? Paper straws. 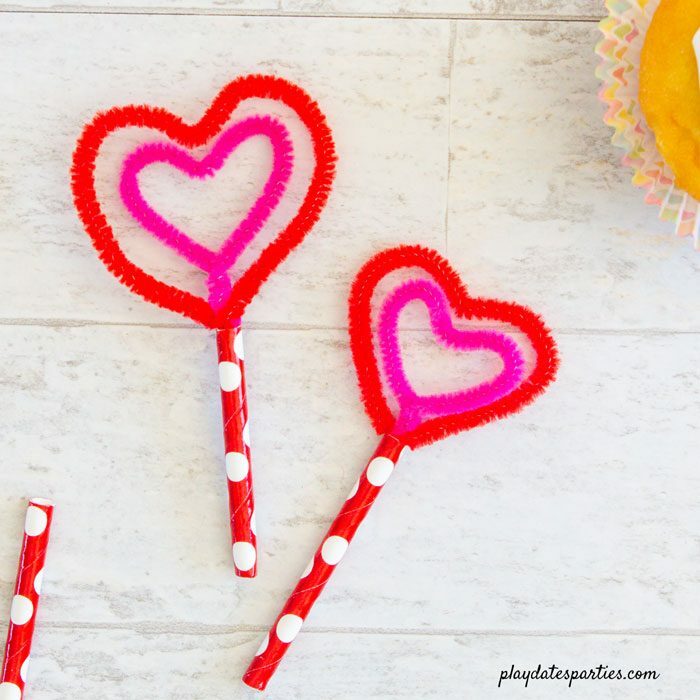 Paper straws are completely food safe, they are firm enough to hold up to being stuck into a cupcake, and they’re the exactly the right size for pipe cleaners! I also happen to have a large stash of paper straws on hand at all times. After all, they are on my top ten list of items to always have on hand! So I got the kids together and we had a mini Valentine’s Day crafting session, making all sorts of heart shaped cupcake toppers. It was so much fun to see the different ideas that each of our kids had to make their own version. 1. First, you’ll need to grab two pipe cleaners in your hand at the same time. 2. 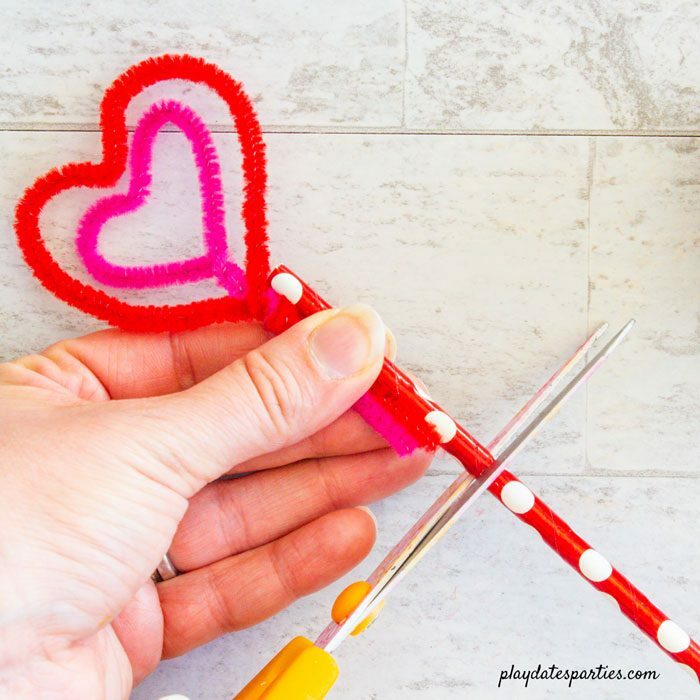 About two-thirds of the way down the length of the pipe cleaners, curl the pipe cleaners around your finger and then pinch to create the dip in the top of the heart. 3. After pinching together the pipe cleaners to get the same basic shape, separate the pipe cleaner that will be the interior heart. 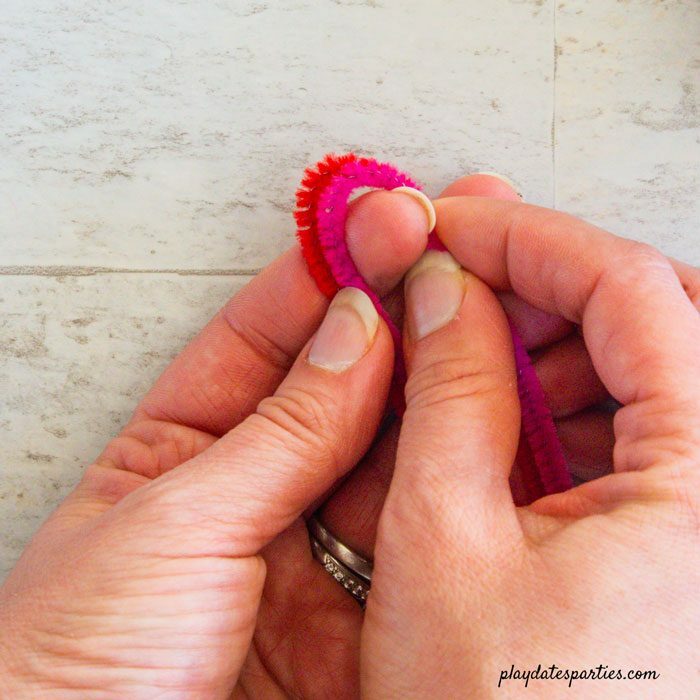 Pull the ends of the pipe cleaner together so that it is smaller than the original size you created. Twist once or twice to hold in place. 4. Add the outer pipe cleaner back around the smaller heart, placing it so that the dip matches the same spot as the smaller heart. Bring the ends down to cross over each other and then loosen the heart shape so that is is bigger than the other heart. 5. Reshape the outer pipe cleaner to match the inner heart if necessary. 6. Twist the base of all the pipe cleaner ends together to hold into place and trim the excess. 7. Cut a paper straw about 1.5 to 2 inches long and then tuck the base of the pipe cleaner into the paper straw. 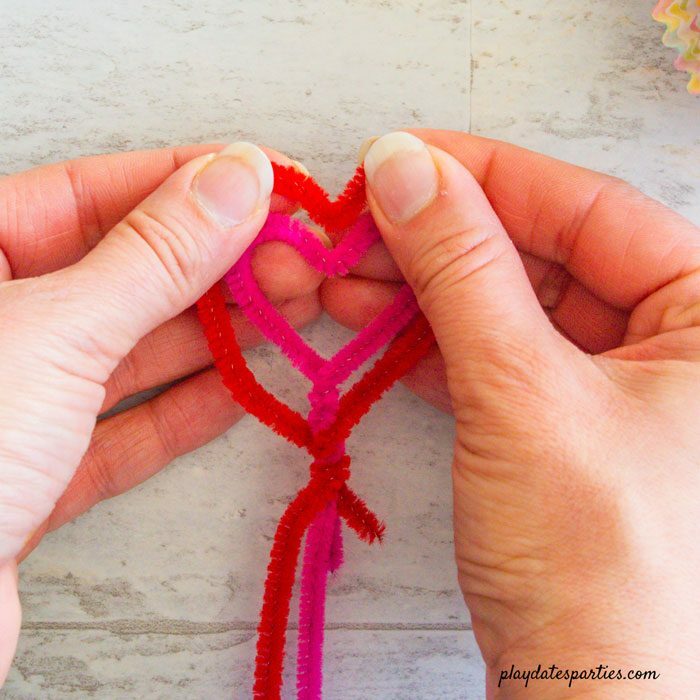 Instead of separating the pipe cleaners at this point, bring the ends down to cross over each other and then twist together to make a basic two layered heart. Tuck the pipe cleaner base into a paper straw, and cut the paper straw to about 2 inches long. Twist together two pipe cleaners in complimentary colors. 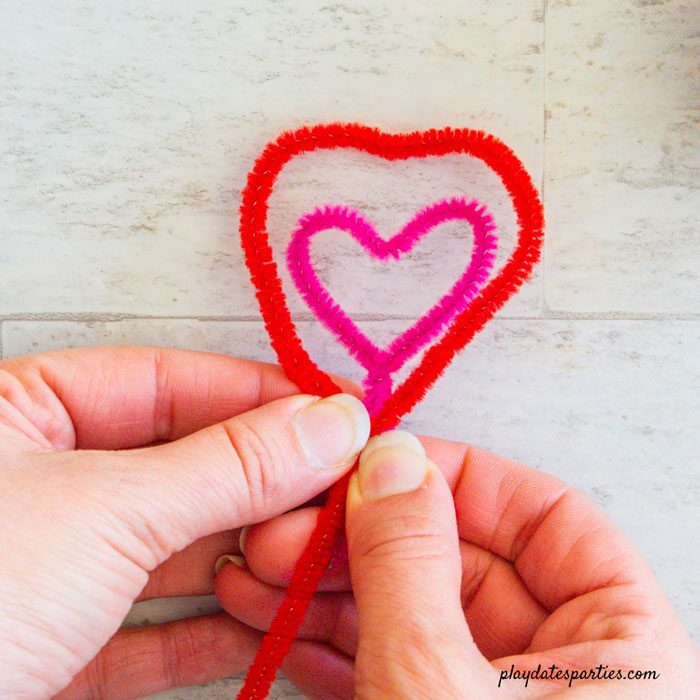 Find the center of the twisted pipe cleaners and then pinch them together to create the dip in the heart. Bring the ends down to cross over each other and twist together to create the heart shape. Trust a 6-year-old to come up with this idea: a round pipe cleaner outside the heart to look like a snow globe! It is winter, after all. If we’d had some tiny snowflakes to add to it that would have been so perfect, right? 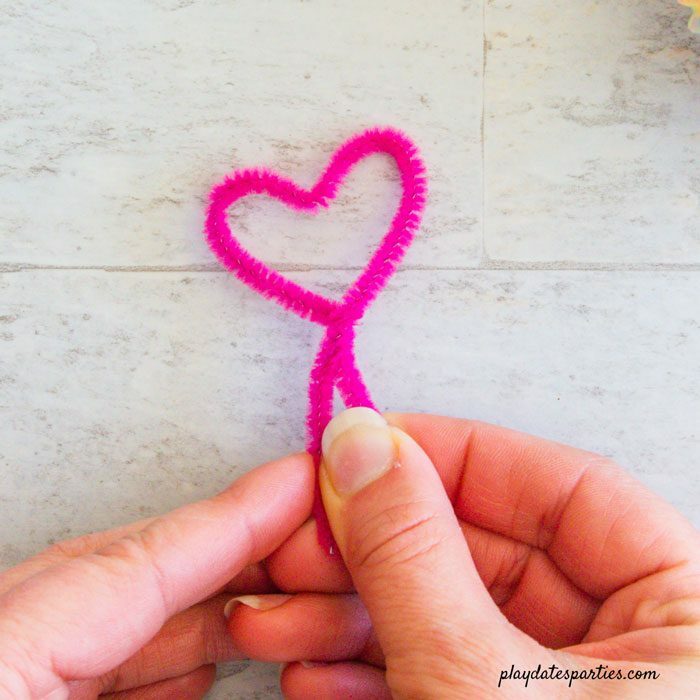 Find the center of a pipe cleaner and pinch it to create the dip in the heart. Bring the ends down to cross over each other to create a small (about 1-inch across) heart shape, and twist together once. Twist one end of a second pipe cleaner around the base of the heart and then loop it over top of the heart to create a circle. Twist the other end of the second pipe cleaner around the base and then twist all pipe cleaner pieces together. Just adorable, right? And it only took us a few minutes to make a bunch of these. Plus, they’re simple enough for most kids to make on their own (the toddler needed some help). 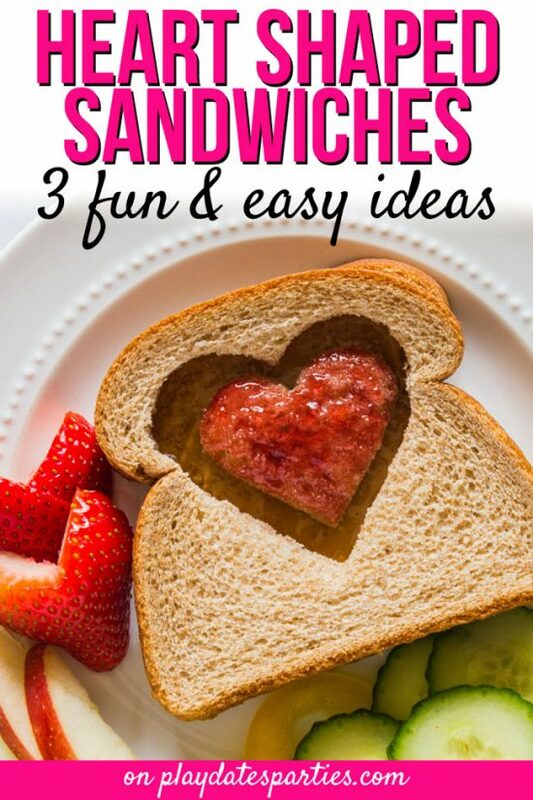 That means you can enlist the kids’ help in making a bunch of them for your next Valentine’s Day party! I’m totally in love with this craft. We came up with four simple, but very different versions. 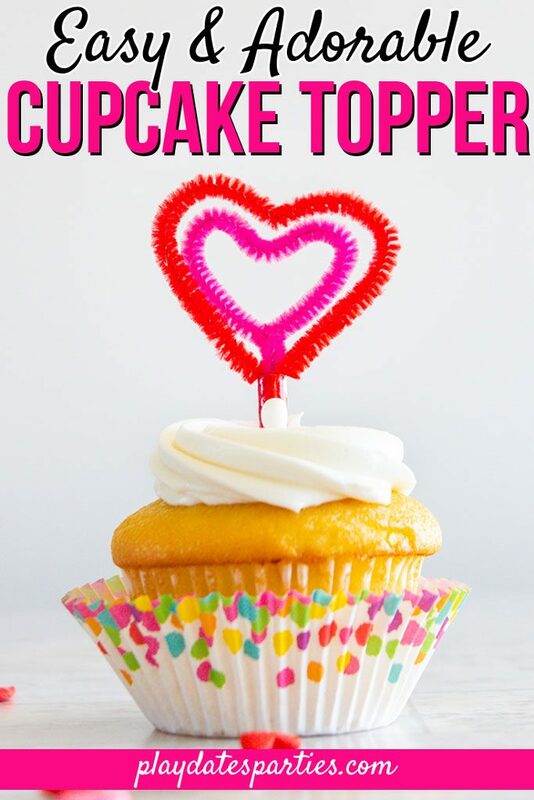 And with no special equipment or tools required, this is a budget-friendly way to make heart shaped cupcake toppers that really wow the kids. …and you don’t have to worry about pipe cleaner fuzz stuck in anyone’s frosting either. Score! 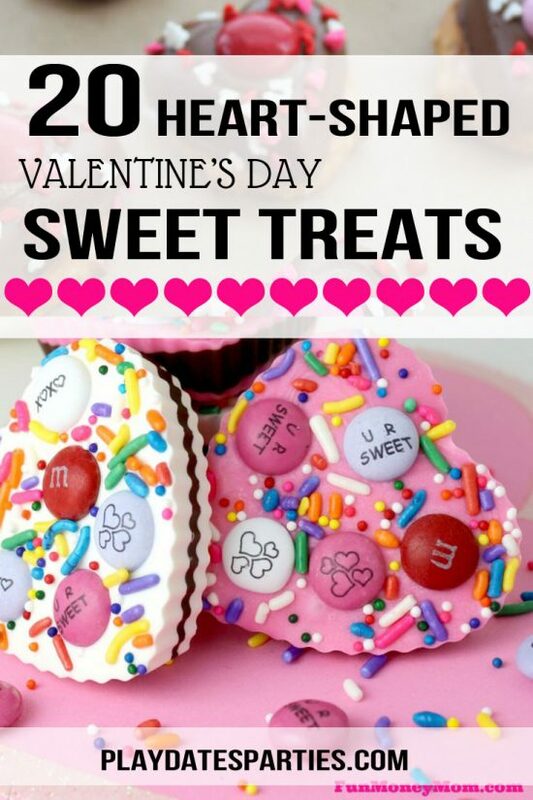 Which of these heart shaped cupcake toppers do you like best? Do you have an irrational fear of pipe cleaner fuzz in your food? How cute! I know my grandboys would love this!